The mission of the Knights is to provide boys and girls in the Finger Lakes region an opportunity to play ice hockey with an emphasis on promoting life lessons and skill development in a positive and friendly environment that will evolve into a lifelong passion for the sport of hockey. 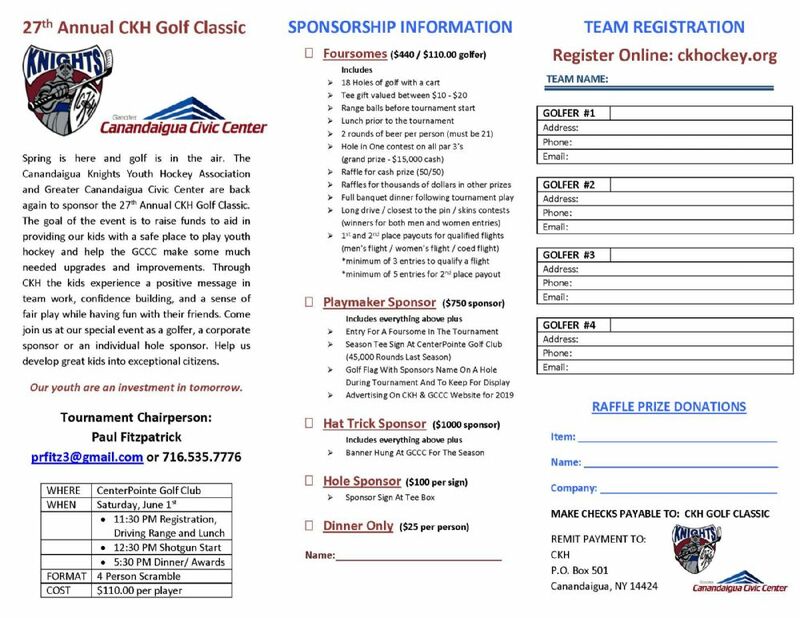 CKH 27th Annual Golf Classic Registration June 1st. CKH 27th Annual Golf Classic Flyer June 1st. 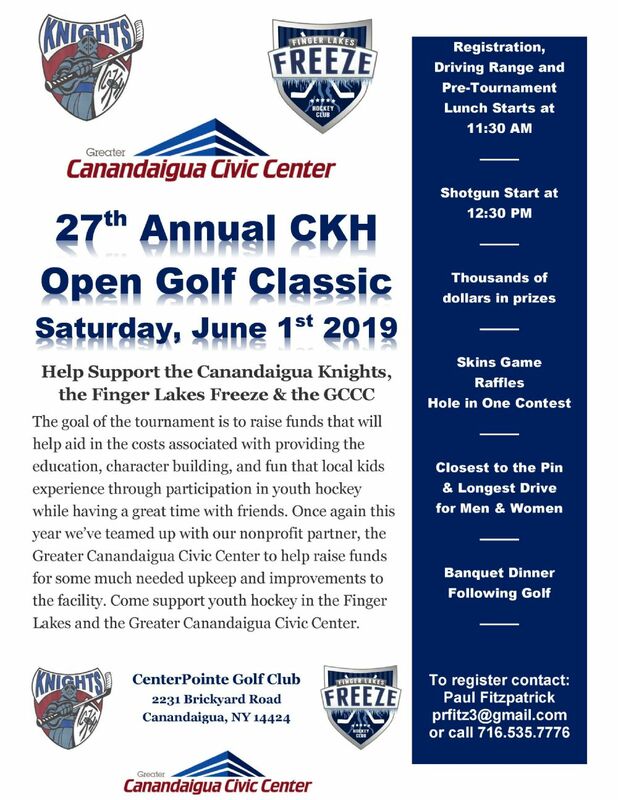 The Canandaigua Knights Youth Hockey Conference is a non-profit membership corporation. We have been providing opportunities for youth in our community to participate in the great sport of ice hockey for over 50 years! We have two open board seats that we would like to fill as soon as possible. We are always open to and grateful for the addition of new volunteers, so if you, or someone you know, is interested in working with a great group of hard-working and dedicated individuals please contact us today! As a reminder, our organization is 100% volunteer-based! We are especially grateful for the nearly 40 volunteer coaches and team managers that donate their time and talent in direct support of the 300+ players on dozens of teams. We see these volunteers every day - on the ice at practice and on the bench during games. And, there are countless other volunteers that we don’t see, but make just as much of a difference: scheduling well-over 500 hours’ worth of ice for practices and games at the Greater Canandaigua Civic Center; scheduling referees for all home games; ordering/sorting/distributing uniforms; attending monthly league meetings; verifying and submitting rosters to USA Hockey; working with area schools and businesses to promote our programs; organizing fundraising events, like our annual golf tournament (Save the Date! June 1st); organizing and ordering equipment for our beginners; and countless other functions that MUST happen, year-in and year-out, in order for our organization to continue to serve the youth in our community. Have Fun! Build Confidence! Play Hockey! Coach Burgio will be holding a mandatory team meeting in the near future. Please keep an eye out for more information from Coach Burgio. Coach Groff will be holding a mandatory team meeting on Wednesday, April 24th at 7:00PM at the GCCC. Coach Storrar would like to hold a mandatory parent meeting on Sunday, April 28th at 4:00PM. More details to follow. Coach Donnelly will be holding a team skate and mandatory parent meeting the week of April 22nd. Further details will be provided by Coach Donnelly soon. A mandatory team meeting will be scheduled in the near future, so please be on the lookout for an email from Coach Stasko confirming the date and time of this meeting. All other squirt players in this 10U age bracket are invited to register for the Knights Squirt A "Empire" team. Registration for the 2019-2020 season will open in mid-April for all teams.